Notes Born to a bloodline that is predatory and territorial in nature, she's never known a life that was easy or full of peaceful resolutions. Her colouration - a see-through pale blue - marks her as a deepsea type of Merkanlos, where colours were a hindrance more than a help. Her flesh is like a jellyfish, including a gel-like feel to it, and she is able to paralyze through touch if she chooses to. 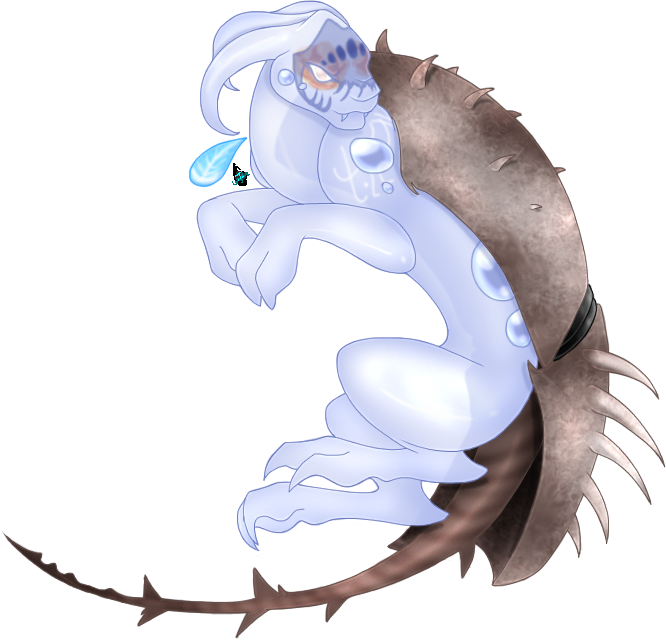 Her shell, and armoured tail, are invulnerable to harm and make blending in to the floor of an ocean bed easy. She has High Magic Spell-Marks on her body that are always glowing, that give her the ability to Banish others. It's a defensive spell that allows for her to violently teleport a target away to a random location. The target will be heavily wounded in the process, and likely, left for dead if they don't appear in an area with access to help.